Antony’s beautiful setting is a Repton landscape with formal gardens near the house, green vistas to the tidal river Lynher edged by the informal tranquil Antony Woodland Garden. 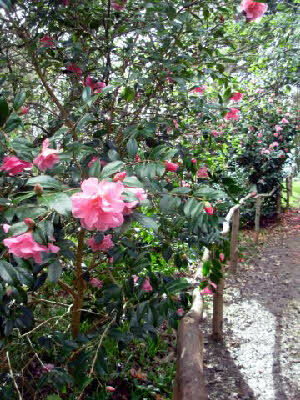 Walking around this "undiscovered" Cornish garden, has been described as visiting "Camellia Heaven". The Woodland Garden consists of the older "Wilderness", with plantings of camellias, rhododendrons, magnolias and other ornamental trees and shrubs, and "Westdown" – a sheltered valley where massed camellias, planted since 1940, provide a dark glossy under-storey from which "torches" of Asiatic magnolias rise - their falling tepals mixing with the colourful camellias beneath. Sir Richard Carew Pole says - "Each generation has loved the place - I see one’s job as handing it down to the next generation looking even better than when it was handed down to me." 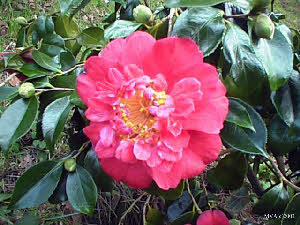 Antony contains the ever expanding NCCPG "National Collection of Camellia japonica". Every plant, including over 2,400 camellias, is recorded on our plant database with detailed descriptions including accession number, source, planting dates and individual photographs. The position of each plant is mapped. A booklet for students and hard copies of the records are available to view as well as the International Camellia Register. Specialist guided walks and a "Camellia Day" are undertaken annually and there are opportunities to learn more, for example, propagating and planting on "Meet the Gardener" days.